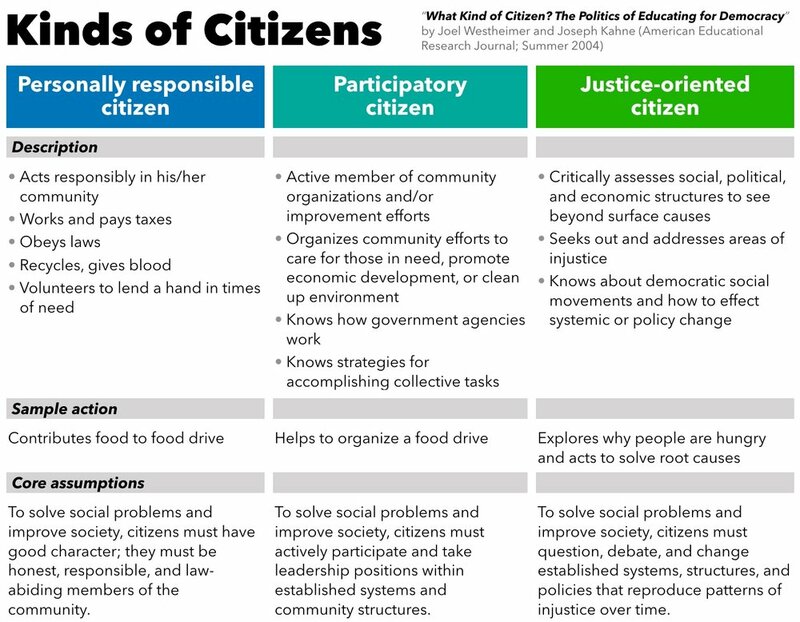 Chart summarizing three models of citizenship from "What Kind of Citizen?" article. Click to enlarge. Social action aims to change policies and is a core strategy for the “justice oriented citizen” described in “What Kind of Citizen? The Politics of Educating for Democracy” by Joel Westheimer and Joseph Kahne (American Educational Research Journal; Summer 2004). The other two models of good citizen — personally responsible and participatory — are mirrored in the direct service and service leadership approaches that have been a part of the Bonner Program from its beginning. With the support of Scott Myers-Lipton, professor of sociology from San Jose State University, we have begun to introduce a community engagement course model through which students learn social action theory and practice while also launching (or joining) a social action campaign during the academic semester in which the course is taught. In some instances, the campaigns students take on will be inspired by conditions confronted through their direct service in the community. It may be informed by a community-based research project they conducted with as part of a class project. And, in the process, they will come to understand an issue by researching a PolicyOptions Issue Brief that brings together information on the scope of the problem, past policy milestones, current policies, model programs or policy options, and key organizations and individuals. In other words, learning how to engage in social action rounds out the skills, knowledge, and collective action goals of the Bonner Program model for student development and community engagement. Social action campaigns often address underlying policies that are the cause of social injustice. While students often develop their own campaigns, they also join those led by community-based advocacy organizations seeking their energy, talent, and access to resources. MSNBC Coverage of successful San Jose minimum wage campaign. Click to watch story. In 2012, the Campus Alliance for Economic Justice (CAFÉ J) developed and helped lead the San Jose Measure D campaign, which won 60% to 40% in the November election and raised the minimum wage from $8 to $10 an hour. In 2015, the Society for Teaching Responsible Options in Nutrition and Growth (STRONG) worked with food vendors to win three changes to city regulations making it easier and more accessible for Fresh Carts to sell fresh fruit and vegetables. We are working to make training in social action available on all campuses either through academic courses or workshop series. Fortunately, social action can be incorporated into a range of academic courses. This past fall semester it was taught in business, environmental studies, and sociology. Recruitment flyer for Students Against Sexual Harassment (SASH). Click to enlarge. In 2017, Students Against Sexual Harassment (SASH) won their demand to force the resignation of a professor who had sexually harassed a student, but after a two-week suspension and diversity training, had been allowed to return to his faculty position. In 2015, Students for DMH won their demand for air conditioning in Dudley Moorehead Hall. In 2015, College Awareness Network won their demand for the institutionalization of a college tour program for third graders that they had developed. While not new, the teaching and mobilizing of students to engage in social action is an often missing offering from campus civic engagement programs. The kind of “hands-on civic problem solving” taught in social action courses and projects is a model for how campuses can train student in the skills, knowledge, values, and orientation towards collective action. Beginning with a retreat for 27 faculty and staff at the Sequoia Retreat Center in February, 2017, the Bonner Foundation for the first time began to offer social action training into the resources and networking we provide to the Bonner network. This chart shows the various ways that social action can be incorporated into campus programs and courses. Click to enlarge. While we have had workshops and speakers on this topic many times over the years, we did not see a clear path for making it more prominent. The course-based approach that Scott Myers-Lipton and others have developed now has us focused on recruiting faculty and staff who can incorporate a social action component to a course or workshop series. After the Sequoia Retreat, we organized a two-part introductory workshop track at the 2017 Bonner Summer Leadership Institute for Bonner staff and students. We have followed that up with a series of workshops, including at the Fall 2017 Bonner Directors and Coordinators Meeting. We also held a webinar for faculty and staff on February, 2018 introducing a social action course model led by Scott Myers-Lipton. Click here for webinar handout. We are actively recruiting faculty, staff, and students both inside and outside the Bonner Network who are interested in starting a social action course on their campus. February 18, 2018 webinar on social action courses featuring Dr. Scott Myers-Lipton from San Jose State University. Our immediate next step is a day and a half course development workshop to be held as a special track at the 2018 Bonner Summer Leadership Institute. This is targeted to faculty and staff who will launch their social action courses in the 2018-19 academic year. We are also developing a “field guide” to give specific examples of lesson plans and other practical steps and handouts for those who are seeking to incorporate social action into their course or workshop series. Finally, we have begun networking with similar efforts to train and support students to do social action. One of these groups, the Community Learning Partnership is "a national network of Community Change Studies programs that prepare students for careers in organizing, economic development, advocacy, policymaking and many forms of public service. Our programs develop new, educational pathways into community change careers. We are based primarily in community colleges that work in partnership with community organizations, agencies and often, 4-year colleges to offer specialized Degrees or Certificates that can lead directly to jobs or provide transfer credit to other educational institutions. Our students gain skills that are valuable in all areas of life and work." See CLP's 2015 Strategic Plan which outlines their goal of "by 2020 will establish 30 community change studies programs and prepare 3000 change agents from low-income and communities of color for careers that enable them to promote community change." We are organizing all our social action resources on the Bonner Resource Wiki here. You can also find an overview of our Policy Research approach on this website. Their website also has a link to Andy Mott’s founding concept paper and analysis that launched the Community Learning Partnership: "University Education for Community Change: A Vital Strategy for Progress on Poverty, Race and Community-Building."